The apple core doesn’t get a lot of love in the kitchen. And often times the peel gets the shaft, too. The duo never make it into apple pie. They hardly get cooked into apple sauce. Even when an apple is eaten out of hand, the core still gets left behind ― unless you’re one of the rare few who knows how to properly eat an entire apple. We’re not here to tell you that you need to eat apple peels and cores, but we do think you should use them to make homemade apple cider vinegar. Because apple cider vinegar can be made with nothing more than your apple scraps plus, sugar, water and time. And the best part is it takes almost no prep time, but rewards you with a big jar of the good stuff. 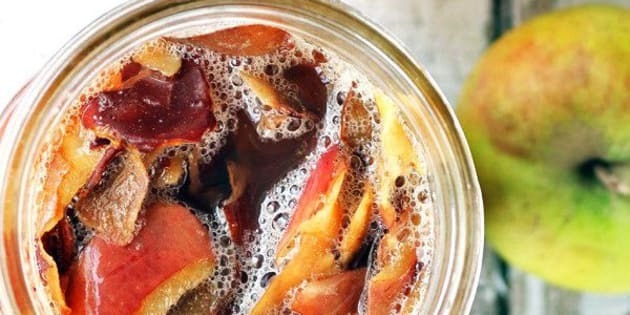 We found this apple scrap cider vinegar recipe from food blogger Don’t Waste The Crumbs, and it is a keeper. The vinegar takes just about two weeks to ferment. It’ll save you money on buying store-bought apple cider vinegar. It can be used in dressings, as a health tonic or for all kinds of beauty uses. Plus, it helps fight food waste. Basically, it’s the best thing ever. Head on over to Don’t Waste The Crumbs now to try the recipe.